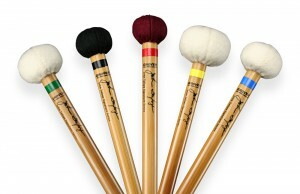 Specially priced set includes 1 pair of each model #1-5! The Tafoya Signature Mallets use very high quality bamboo shafts that are slightly shorter and thinner than our Artist’s Choice bamboo mallets. The dimensions are 15” length x approx 7/16” diameter. The bamboo is finished using an amino flat finish that is both easy to grip and protects the bamboo from the elements. All shafts are hand-paired by weight, color and feel to ensure proper balance.